WeCare Removals team gives you every time not just technical and strategical solutions to different kind of removals or tips like Moving House Checklist, but also some team-building relationship tips that for sure will make your moving experience one of the most vivid memory and may also be taken as a beginning of new traditions that will bond your family members with the new house and the neighbors, and only because WE CARE about you - we investigate and still search for the best activities among party-managers that you can easily adapt and use straight after you move in. So here we present you the latest version of 10 steps of having a Welcoming-House Party for you, your family members, your new neighbors and friends. So let us begin first of all with the fact that you now need to forget about house removals costs and you are throwing a party and you can actually ask your close friends to give you a hand with it, so the new environment might transform its hostile air into a snug and pleasant space where your friends can always come to visit you even if you moved miles away, this decision actually can give you extra-energy for what’s coming in the stage of adaptation to new surroundings. A great deal of time will take you to call and explain or ask your close friends and relatives, co-workers and new neighbors to come to your moving-in party, so use this situation to work for you: - take some minutes to think about how many people your new house can have, where you want it and what you can do depending on your budget, weekday, location and season and send some invitations. Mention the specific details about the new address, the reason so people know what to expect and if you necessarily want to see them all, persuade them with a crumb of information about what are you planning to do, you will see they will call you as soon as they get it to confirm that they come. You can use this means of communication to inform about your new location. If planning on a huge party, make sure you specify some things like party theme, dress-code, time of staying and specific requirements- this may cause some misunderstandings between different groups of people that don’t know each other, so make sure your friends don’t hate you after this party. Begin with the entrance- the atmosphere of the new house should be seen from the first step, so if you have a hall or staircase with railings on the way to the main entrance, use some decorations to give it a festive status; you can use the walls, the doors and lamps to hang some party like- garlands and fluffy decorations in a certain theme or just multicolored. If you have kids involve them in the adorning activity, just give them the mission to create some pom-poms and they will be busy, satisfied and enthusiastic about the whole process of homecoming. If it is what you plan for a while –choose a theme for the party to make it last, and if you want to make it in a private-circle way use the comfort over sophistication and add a drop of natural riches from the nature to offer a safe feeling. You can always bring in some branches of fresh wild flowers and mix them with your flower pots to create a fresh look around and inside your new house. Fill the corners, windows and shelves with any kind of thematic items like confetti, balloons or noise makers or natural flowers, beautiful stones and wood bark. In pots or vases, on the floor or around the room, just make sure the décor and especially flower vases aren’t in the way of your kids or pets. No matter the season you can also add some natural color from berry orchards or autumn golden leaves, Christmas tree twigs for a celebrating smell or even seasonal fruits and vegetables at the windows for a homey feeling. Use the small details to fill the space with the needed background. The best scenario includes the daylight shine for beginning the welcome home party but in case it is in the evening, turn on all the lights for an active talk or some lamps or secondary lights for more silent chats and when the kids go to their rooms, slowly turn the party lights on. Here you can use hand-made paper cuts to over wrap the light bulbs or some twinkle lights from any other party or friend that can borrow them for a day or two. The proper light will create a relaxing and private celebration mood, so don’t neglect the possibility of using even candles, but in this case make sure you follow all the necessary security precautions. If you have a porch, terrace, garden or a yard- take advantage and use it to add some small light-spots for adding cozy atmosphere around the house especially during the warm seasons. Depending on the age and traditions you and your family have, choose a familiar play-list. Add your favorite movie soundtracks, dancing preferences and even popular singing songs that you all love to sing. Make a long one and consider everybody, because you may not have the chance to play the DJ while you are needed in the kitchen, hall or dining table. Take advantage of the seasonal songs and cultural background of your family and if you have a family member or a close friend that is at short hand with music, delegate this job to him, promise people will love to help by doing what they are competent at. Don’t forget about children’s age and add some funny cartoon songs. Taking into consideration that we are talking about a welcome home party, champagne is a must-have number one hero on your table. You can either choose to wait for everybody to come and then to give a speech and afterwards to open it, or to welcome each guest with a glass and continue with any other bar drinks you are planning on having. No matter the decision, we advise to keep it simple and have no more than two or three types of drinks like beer or cocktails in order to keep your guests outside the multitude of empty glasses, and also prepare the soft drinks like soda, juice and ice if summer time. A very important issue at any party is the food. It can either give a headache or a free hand to enjoy and be around your guests without worrying about courses and washing-up, so opt for the simplest easy-to-take snacks. Start off with a typical “fourchette” table- mini burgers, canapés or sandwiches and fresh fruits,cupcakes and muffins for desert ; and if you have a more traditional table, the take away meal can solve it all-order some pizza, finger food , fish and chips like food and keep it as informal as possible for a relaxing party. In case it is your first move and you have invited your new neighbors, we must warn you that there is a chance that you will get some welcoming presents – like pies or cakes, in that case make sure you appreciate the effort and share whatever you may receive with all the people. Don’t forget about the vegetarian preferences if any. In case your neighbors aren’t capable or available to come to your celebration, bake something before the party and serve them, take this opportunity and be the first to knock on their doors, by the way it can be the best chance to talk about the upcoming party and to discuss and prevent about all the possible inconveniences like noise, overcrowding the parking space and settling some agreements. Make sure that the neighbors will have their first impressions based on how you keep your word so stipulate with your guest the things you should respect or things that are forbidden if any to avoid any further unpleasant comments. As simple and unimportant it may seem, consider that you will spend over the table a good deal of time and having a nice and well-looking table arrangement gives you a celebrating mood, so take a minute to set around the table, regardless of its purpose, dinner space or snack place, some stylish ribbons, a representative tablecloth, thematic napkins or a decorative cutlery paper holder or some party hats on the same plates or corners. In order not to create the discomfort of changing and cleaning the plates and glasses, use disposable ones, it will give you a less serious allure and no cleaning up bothering hours. Prepare ahead some trash bags for keeping it as smooth as possible. 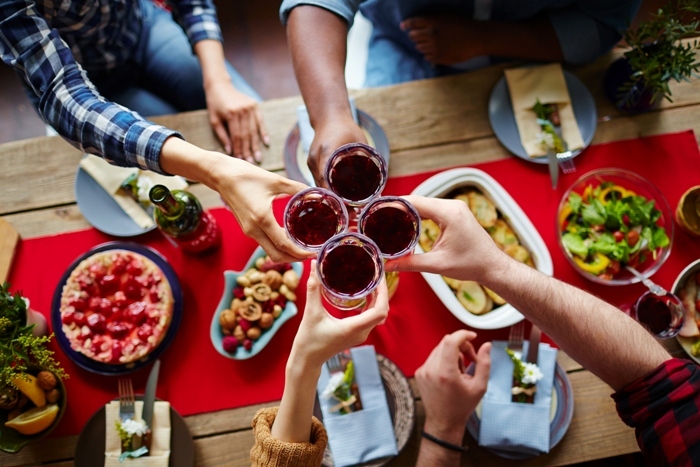 Discuss with your guests about taking out the food and drinks to keep your party according to your plan. people with kids, if so- prepare a special place, activity like a game or some art tools to keep him involved so that the parents can have some time of their own. If you have children of your own, the perfect solution is to give them a couple of DVD’s cartoons to watch. people with pets, if so- prepare a special area for its needs, and make sure you find out about any allergies in order to avoid bad outcomes. If it is small and safe enough you can have it for your kids, just make sure it doesn’t create discomfort with already present pets from or around the house. If you have the possibility to oversee this possibility, mention about the pet restriction for the time of the party, it will give the feeling that nothing can go wrong. People with special needs, if so- make sure you have the necessary information about his basic requirements in order to realize if you are able and ready for this. Here we have to add the fact that you should really be prepared with the hygiene supplies and medicine kit, hope it won’t come to any intervention but in case it does you have to be sure that you can provide first aid help and that your party won’t become a disaster. Now that you have the basic steps in planning a welcome party, don’t forget about your personal host satisfaction and don’t be shy to ask for help and support your dear ones and as an additional hint for the party-maker to have an accomplishment feeling and a peaceful mind at the end of the party, reassure yourself and mention the time of the beginning and ending party time, including the after-party and advisable to keep it as far from midnight as you risk to have night guests and in case you don’t have extra space or sleeping bags, the person will be forced to look for a hotel if it is far from his house, or you will have to drive him home, in this case you have to keep it dry, so in order to make it clear- mention the time of departure or prepare extra overnight place or as an alternative ask people that have board games to bring them so you can have an active entertaining after-party. Not the least important peculiarity to remember is the cleaning process, so do the maximum in the same evening after the guests are gone to reduce to the minimum the morning trouble so you can have that achievement feeling all over your house and family. Now that your welcome party is casted and you know what and how to do, stick to the plan and don’t forget that next party is there to come and stay for much longer and WeCare Removals is there beside you with even more ideas, you have everything you need to make the happy staying party for good and lasting and we will help you with that. Whenever you are ready to start shape and color in your mind your new home, tell us and we will gladly book your next house removal. Contact us on 0800 368 7707 to see what masterpieces we can create together and how your new house transforms into your home. We are there on-line to maintain you up-to-date with all offers and discounts for House Removals, Office Relocations, Packing Service and lots of advices. Sharing is caring and WeCare Removals is there for you.